WW2 P-38 Lightning Airplane Section. World War 2 Military Airplane Model Department. Lockheed P-38 Lightning World War 2 Fighter Airplanes. Balsa Wood Model Kits, Mahogany Models and Links to all other types of airplane models. Balsa Wood Model Kits are the Best Educational Toys because they require a large variety of construction skills. These wood models are educational kits for kids and adults teaching model blueprint reading, construction skills, airplane history, military and world history, airplane aerodynamics and aeronautical engineering. Wood Model kits require special model builders tools and wing coverings. These are truly the worlds best educational toys. Balsa Wood Model Airplane Kit. This remarkable laser cut kit of one of World War II's fastest fighters includes hand selected balsa, color peel-and-stick decals, vacuum-molded parts, light weight colored tissue, and full-size plans with step-by-step instructions. 30" wingspan (approximately 1/20 scale); 150+ parts, assembly required. Balsa Wood Airplane Model Kit. This WW2 fighter plane is truly a beautiful replica of one of the most famous fighters of the war. 1/16 scale with a 40" wingspan makes for a large rubber-powered flying or display kit. Includes operational features such as movable control surfaces and retractable landing gear, gorgeous decals, and beautifully formed plastic parts. Pre Built Mahogany Airplane Model. Made of Philippine mahogany, this 1/32 scale model measures 14½" in length and has a wingspan of 19½". Hand painted and detailed, model comes ready to display on the included mahogany base. Made of Philippine mahogany, this 1/32 scale model of Marge - the P-38 Lightning flown by 40-victory ace Major Richard Bong (America's all-time leading ace) of the 49th Fighter Group - is hand painted and detailed, measures 14" long with a 19" wingspan, and arrives ready to display on the included mahogany stand. Featuring the markings of Charles Henry "Mac" MacDonald's Putt Putt Maru, this 1/32 scale model, made of Philippine mahogany, measures 14½" in length and has a wingspan of 19½". Hand painted and detailed, model comes ready to display on the included mahogany base. An eye-catching tribute to the P-38J Lightning, this beautifully handcrafted, 1/27 scale, mahogany sculpture has a clear lacquer natural finish. 23" wingspan; arrives ready to display on the included wood display base. Made of Philippine mahogany, this 1/32 scale model of Pudgy - the P-38 Lightning flown by 38-victory ace Thomas McGuire - is hand painted and detailed, measures 14" long with a 19" wingspan, and arrives ready to display on the included mahogany stand. 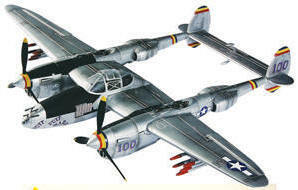 Made of Philippine mahogany, this 1/40 scale P-38J Lightning measures 11 ¼" in length and has a wingspan of 15 ½". Hand painted and detailed, model comes ready to display on the included mahogany base. This collector clock features images of the USAAF P-38 Lightning - including a cockpit view - framed in a distinctive riveted aluminum case. Also features a quartz movement, requiring one AA battery (not included). 14" diameter. This collector clock features the unique P-38 Lightning along with classic nose art framed in a distinctive riveted aluminum case. Quartz movement; battery not included. Made in U.S.A. 15" diameter.